This goes out to two very special Jessicas. First, the creator of this recipe– Jessica Field’s– Mrs. Field’s daughter. The second to Jess P. whose birthday was last week– and for whom these cookies were made. To quote Mrs. Field’s cookbook, “The Marshmallow Clouds came from Jessica’s idea to wrap chocolate dough around a marshmallow and then bake it. We call them “Clouds” because they are heavenly! Like our own family favorites, each one of these recipes has a memory associated w. it.” Sam & I made these as kids… though I have to say, they are even fluffier and gooey-er than I remember. Preheat oven to 400. [I lined cookie sheet w. parchment paper.] Until you assemble the cookies, keep marshmallows in freezer- otherwise they thaw too quickly. In a medium bowl, combine flour, baking soda, cocoa and salt [if using unsalted butter.] Set aside. Combine sugars in a large bowl. Add butter and blend w. an electric mixer, scrape down sides of bowl. Add eggs and vanilla, beat at medium speed until light and fluffy. Add flour mixture and choc chips, and blend at low speed until combined. Batter will be very stiff. Gather 4-5 frozen marshmallows in the palm of your hand, cover them with a heaping tablespoon of dough, wrapping the dough around the marshmallows, completely encasing them and forming a 2-in diameter ball. these look incredible. devastated i haven’t been able to try one yet. Hands down the best cookies I’ve had in a long, long, time. I plan on making these for my dad on Saturday. Thank you for these bday cookies – they were AMAZING! 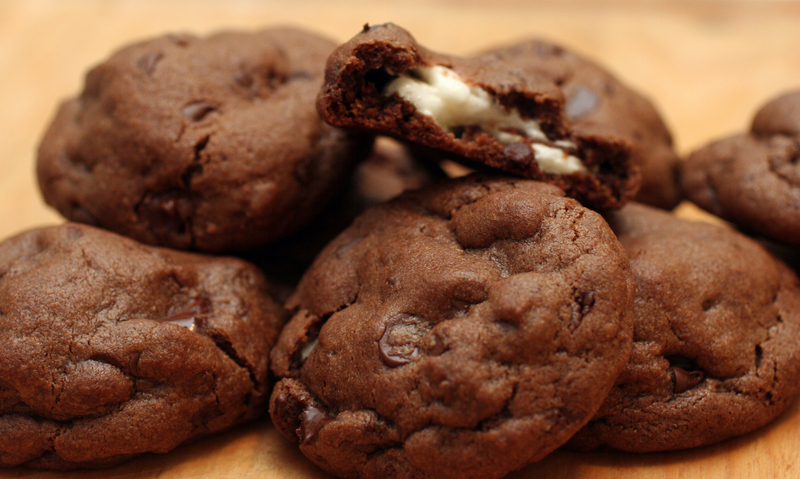 So chocolaty and gooey…and on top of it all – they stayed fresh for several days after they were baked. Perfect!